Camira makes “fabrics for spaces and places” as the company states itself. Its products are used in a vast array of commercial interiors, such as offices, schools, healthcare and retail, and for passenger transport on bus, coach and rail. The UK-based company – recognized for designing and manufacturing innovative, environmentally sensitive textiles – produces over 8 million metres of fabric a year in its manufacturing sites in the UK and Lithuania. The Camira spins and dyes yarn, grows bast fibre crops to blend with the wool and weaves on over 100 looms to create beautiful fabrics – from classic to trend-oriented and always meeting highest quality standards. 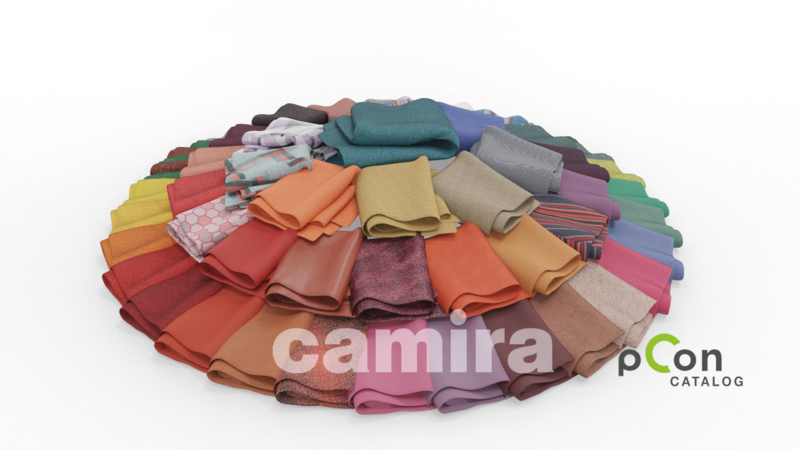 With Camira fabrics now available in pCon.catalog, it is easy to use the textiles in your virtual interior designs: Select a fabric and place it on the object of your choice. In pCon.planner, you can also find the fabrics under the Materials tab. This entry was posted in Room Planning and tagged Camira, fabric, materials, pCon.catalog. Bookmark the permalink.